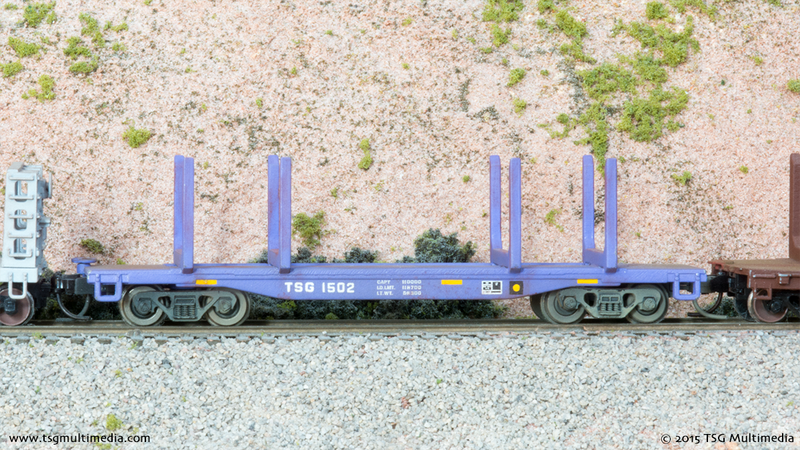 I custom painted some N scale log cars for our fictitious Tuscany & Sabine Grove railroad. Somewhere along this imaginary line there is a lumber mill or some other industry that either uses or produces logs. Naturally the T&SG needs some equipment to haul them. Two of my N scale log cars are from Walthers. I have a few more of these decorated for other railroads or private owners. I also have some of the Micro-Trains log cars. All together they make a fairly decent length train. This car started as an undecorated Walthers log car. I installed Atlas metal wheels in the original trucks. 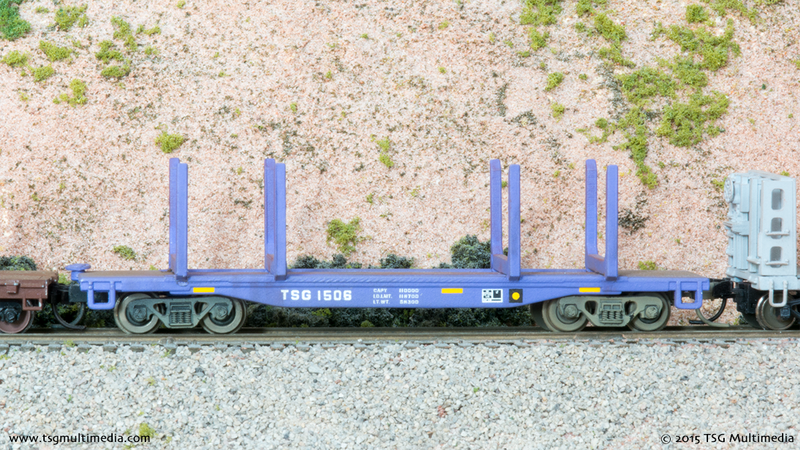 The design of the car prevents the use of Micro-Trains trucks with truck-mounted couplers. The coupler boxes hit the underside of the car floor. Eventually I may body mount some Micro-Trains couplers and substitute Fox Valley wheels. The car was painted in Polly Scale Atlantic Coast Line purple. Since that paint is no longer available I may have to use a different color in the future. I still have a bottle or two stashed away. The markings are from various Microscale N scale freight car data decal sheets. The reporting marks were pieced together from an alphabet sheet. I used powders to dirty the upper surfaces of the car. The truck sideframes were airbrushed with a thinned earth color paint. This car is almost identical to TSG 1502. I came up with a numbering scheme for our fictitious railroad. 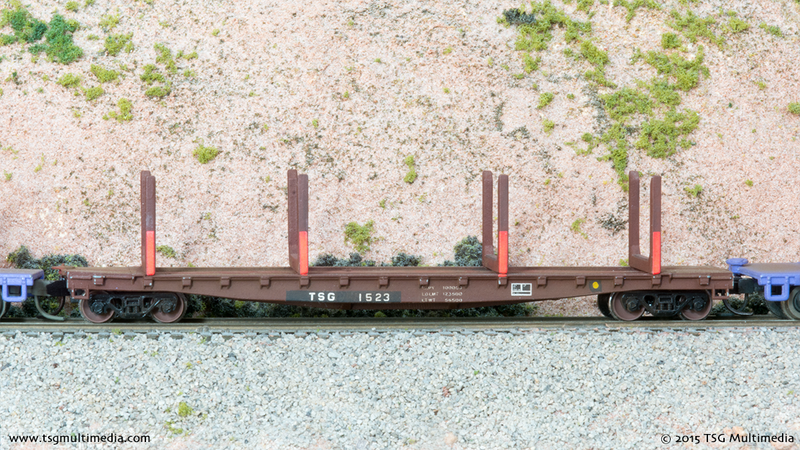 Log cars are in the 1500 series. I try not to use consecutive numbers when making multiple cars. I think that makes it seem like there are more cars on the railroad somewhere. If there is a 1502 and a 1506, then most likely there is also a 1501, 1503, 1504, etc. These theoretical cars don’t have to actually be modeled. Their presence is suggested by the number sequence. This car is different than the other two N scale log cars. I purchased this one secondhand off eBay. I don’t often buy kitbashed models built by other people so this one was an exception. When it arrived it looked much as it does now. I don’t know who made the flatcar body. It appears to be made of die-cast metal. The car had minimal markings when I got it. I patched over the original number and assigned a T&SG number. 1523 is still in the log car series. Since this one is an oddball it suggests that there are at most twenty or so cars like 1502 and 1506. I added the data and wheel inspection dot with decals. The red warning stripes were already there. I did replace the brake wheel on the car with a more modern one from Gold Medal Models. I also substituted Micro-Trains roller bearing trucks for the original. The car is equipped with Fox Valley wheels.